Rory Skinner braved the pain of a fractured foot to share the British Talent Cup spoils with Max Cook this weekend. The Scotsman emerged triumphant from a four-way battle to win on Saturday, before Cook prevented his clean sweep by just five thousandths of a second this afternoon. Skinner immediately took advantage of his pole position in race one, with Red Bull Rookies Cup rider Cook just behind as Charlie Atkins slotted into third. But Skinner and Cook soon stretched a gap over the field as Strudwick tucked into third spot, though still nearly a second back on the front-running duo. Strudwick, however, closed the gap down and moved ahead of Cook for second on lap 10 before taking Skinner on lap 12 to take the lead, while Storm Stacey came from down the field with four laps remaining to join the four-way fight for victory. The quartet was all change in the final few laps, but it was Skinner who pulled out the win, holding off the slipstream attempts of the chasing trio to beat Stacey and Cook to the top step as Strudwick was knocked off the rostrum. In race two today, Skinner was straight back out into the lead and despite Strudwick’s pass at Ossebroeken, the race one winner took the lead straight back and it was soon another three-way scrap with Cook once again in the mix. But it wasn’t long before Strudwick was dropped as Skinner pushed the pace with he and Cook pulling over three seconds clear of the season-long points leader. Despite Skinner leading the entire way, Cook made a final push at the Timmer Chicane and and stole victory by a mere 0.005s, leaving Strudwick to pick up third. After Skinner was handed crutches to hobble off the bike and onto the podium, his crew later confirmed that his foot had been recently broken in four places. 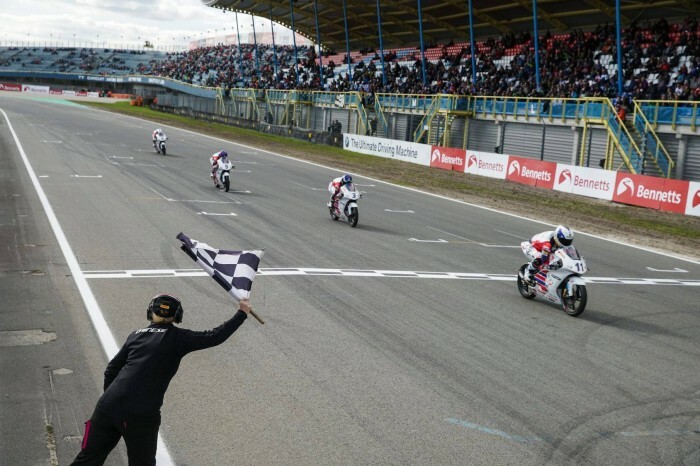 With a first and second, he has now stolen the series lead by 12 points as the Talent Cup now heads to Assen in November for its season finale.